A cliche of modern discussion in social marketing is to focus upon ROI and how elusive it can be. We’ve been exploring the topic ourselves plenty recently. Although we firmly encourage the use of social data to measure the performance of a business – facilitating better decision making and indicating the return on different investments – what about the return on social activity itself? In 2013 Coca Cola famously revealed that the brand was unable to find a direct link between social activity and short-term sales, a position that was later clarified when its President of Strategic Marketing, Wendy Clark, underlined the importance of social media’s ability to enhance marketplace impact, consumer engagement, brand love and brand value. This vaguer, difficult-to-quantify impact upon the bottom line was enough to satisfy many, but still left social media a fair distance away from those crucial board room revenue conversations. The debate has recently been reignited with the claim from Unilever that they’ve discovered a direct relationship between social activity and product sales. Shawn O’Neal, VP global people data and marketing analytics at Unilever, implied that the linkage extended not just to correlation, but elements of causation between the two datasets, without revealing any detailed information publicly. So, does social activity drive sales? There’s a reason that so many consider ROI to be elusive. The case studies available are scarce, and the conclusions can be difficult to apply across industries. One helpful example comes from Eventbrite, the global marketplace for event planning and organisation. According to its internal data, the company found that social media shares could be assigned a revenue value in terms of how much they delivered for the business on average, which varied by platform. On Facebook, it generates an average of $3.60 in additional gross ticket sales for each share. A share on Twitter, meanwhile, drives an average of $2.90, and an event shared on LinkedIn generates an average of $1.99 in additional event revenue. Beyond those first three networks, data from other sources suggests that even Pinterest and visual networks can provoke sales, meaning interactions can be measured in dollars. Piqora suggest that the average pin generates 78 cents in sales and drives two visits to company websites. Data from RJMetrics and Harvard Business Review testify such a claim: 69% of online consumers who visit Pinterest have found an item they’ve purchased or wanted to purchase, and 21% of users bought an item in a store after pinning, re-pinning, or liking the item on the site. Research we embarked upon with a leading videogames publisher provides further evidence to the monetary value of social. The company was having a tough time matching conversation volumes around their brand with sales numbers. When trailers, previews and teasers were released, spikes in conversation were noticed, but this didn’t appear to have any bearing upon final sales figures once the game was launched. It conducted a detailed research program in order to investigate the nature of different peaks, and which conversation stage (pre-release, release or post-release) has the closest relationship to sales figures. Although no direct correlation was found between buzz and sales, the research discovered that purchase intent mention figures increase gradually before the game launch, the volume of which were a very strong indicator of sales success upon launch. How this differs to the Eventbrite example is that rather than taking raw social activity volumes, the brand isolated the data to exclusively the mentions including purchase intent, and thus were able gauge the success of their promotional activities extremely accurately. A study by social sharing technology vendor AddThis explored the topic from a different angle. In the same sector, it found that the relationship between social shares and product sales is tighter than the link between online searches and sales. A compelling investigation by Bain demonstrated that simply engaging with customers on social media can vastly increase the amount of money they spend on your products. Even those that are neutral or normally detract from the brand will spend more money if sufficiently engaged on social with that brand. In a similar vein, eBay found that those customers it managed to engage with spent 54% more on the site than those that were not engaged with the eBay community, further testament to the value to brands of building social relationships with consumers. This is once more evidenced by research from Wet Seal, a clothing retailer, which reports that social shoppers have a 2.5 times greater conversion rate than the average customer. An industry often paralyzed in transition between old and new media, social has shaken up the media space quite thoroughly, from print to TV; from advertisers to broadcasters. Yet another interesting finding from the Unilever research team is that apparently only one in a thousand TV ad impressions prompts a sale. O’Neal himself compared this with data from PixonEye, which showed social impressions to be four times as effective at generating sales – or forty times as effective when targeted to a specific audience. Next: to the world of cinema, where advertising company 140 Proof studied the four week period around the release of 25 movies. Once again, the story was slightly more nuanced than buzz equaling sales. Though no correlation was found between raw social activity and sales, when the conversation was isolated only to influencers, the relationship became much more meaningful – helping 140 Proof conclude that social could, and did, have an impact upon sales. 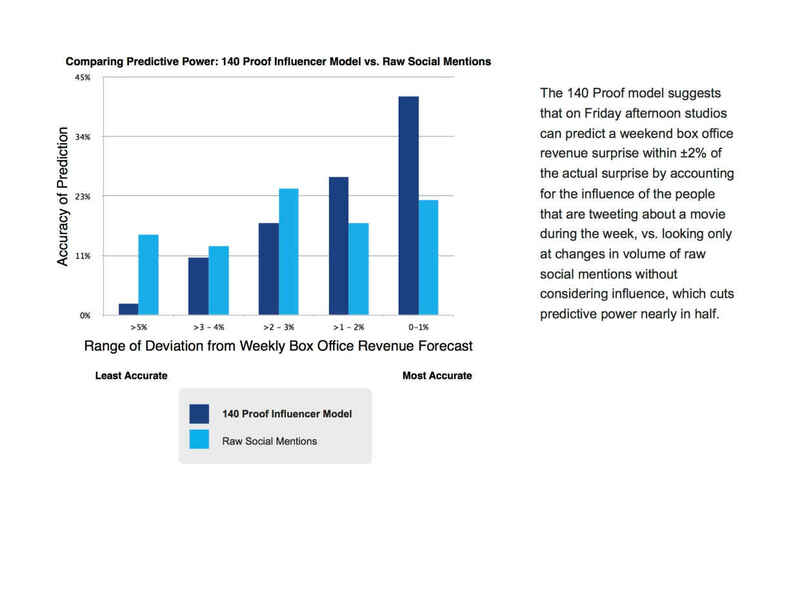 The advent of second screening has also provoked big claims of social ROI. A close inspection of social and TV by Google found that online consumer engagement, as measured by new Twitter followers and overall buzz, correlates directly to having an active social media strategy. Most significantly, linking online buzz to sales, Google found that buzz could be an excellent predictor of sales – with one caveat. Song, contestant characteristics, and quality were better sales predictors; an effect amplified when blended with social data. This suggests that buzz and perceived product value together can best explain sales, rather than either aspect alone. Another means of assigning monetary value to social is the damage it can avoid. From customer service to reputation management, social offers plenty of new ways to create value for brands. According to data from NM Incite, prompt, effective social customer care triples the likelihood that customers will recommend that business to peers than if they do not engage at all. UK telecoms giant BT found that they gained over $3m through its social customer service offering – savings generated by comparing it to handling customer queries through other, more traditional means. Famous consultancy experts McKinsey also found bad buzz for an unnamed telecom client hurt signups by 8%, offsetting its entire TV spend. There is no cut-out-and-keep template for measuring the value of social. It varies greatly across sectors, and changes even more from brand to brand – and how social can be dissected and partitioned from other activity can pose quite the challenge. What is clear is that a relationship exists between social activity and dollars generated. Its particular shape morphs and reforms as it is fits the frame of each organisation, but crafting the specific framework for measurement for each is a nuanced and complex task. Blending datasets and experimenting with different types of analytics will be crucial for businesses seeking to attribute monetary value to social, and the forays that social makes into board room presentations will only continue. We’ll continue to investigate, explore and share the emerging, conflicted relationship that social enjoys with ROI and encourage stories from the front lines.